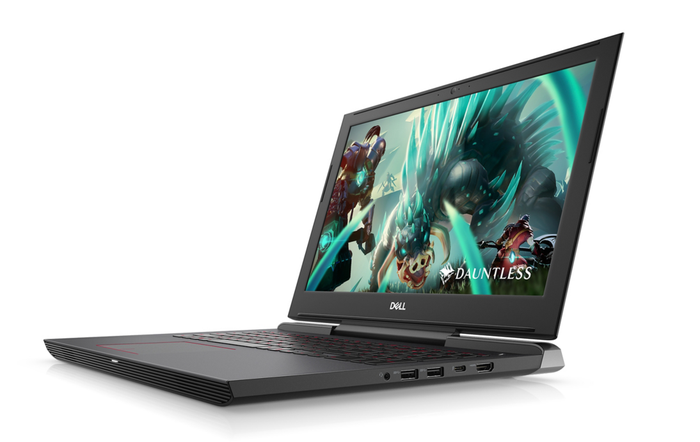 Though it lacks a lot of the bells, whistles and dedicated features, the price-to-performance ratio in play for the Dell G5 allows it to hold up as an easy-to-recommend gaming laptop for those willing to make a few sacrifices. 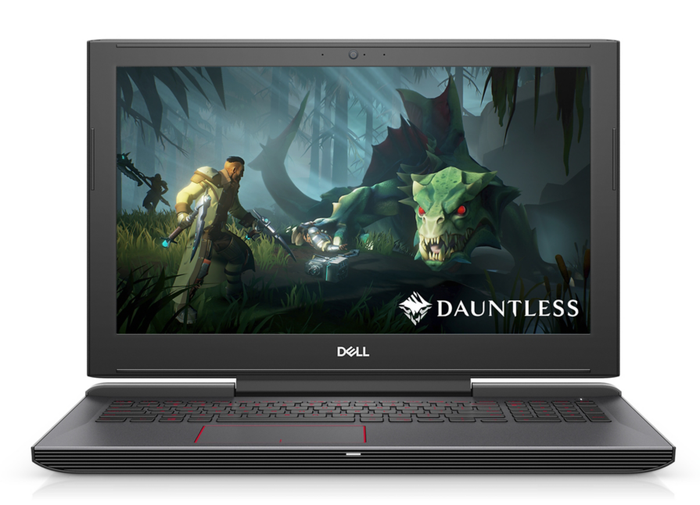 Though more widely known for its Alienware sub-brand within the space at large, Dell has quietly been making headway when it comes to gaming laptops under their own umbrella-like branding. Their logic: not every customer looking for a gaming laptop needs the ‘extra’ aesthetics and features that come part and parcel with gaming brands like Alienware. Sometimes, you just want gaming-grade specs in a normal-looking body. The new Dell G3 and G5 are the latest installments in this effort and - though imperfect - they manage to scrape through with a compelling grab-bag of virtues. They’re clean, easy-to-live-with laptops that carry with them more than enough grunt to get the job done. What they lack in features like RGB lighting or mechanical key switches, they make up to for in price-tag. Speaking as someone who isn’t beyond appreciating a good bit of neon-lit, sci-fi-death-machine action but doesn’t necessarily want one I can take with me on the train, the G-Series feels like a breath of fresh air. Though the spec-sheets are certainly comparable, there’s a distinct visual gulf between what the Dell G5 - and the larger G-Series- looks like and what every product under Dell’s Alienware banner looks like. To the eye, the Dell G5 plays the part of a fairly stock-standard - if a little bulky- portable PC. It’s a little ordinarily at a glance - but compelling clean and reassuring in its presentation. Port-wise and beyond, everything is more or less where you expect it to be and the stylish Beijing Red color scheme gives it a fighting chance of being mistaken for a more professional workstation. Like the new Razer Blade and MSI’s GF63, the Dell G5 feature dedicated graphics implemented in NVIDIA’s Max Q configuration. Unfortunately, this dot-point doesn’t really shake out as thin or light as some of the other Max Q laptops out there. It’s nowhere near as bulky as a laptop like this one would have been three or four years back - but it’s no MacBook Air. It’s still heavy to carry and the idea that you could play games on your commute with this thing is more of a loose-technicality than a compelling-possibility. The keyboard and trackpad don’t help here. In context, they’re probably the key weakness to the gaming experience offered by the G5 - even if their shortcomings are somewhat by-design. As mentioned before, the Dell G5 is more of a workman’s laptop with a gaming machine’s guts. It doesn’t have any robust or clicky keyswitches, it doesn’t have RGB lighting and the trackpad itself is a little lackluster. [Related Content: How do I decide between a Core i3, i5, i7 or i9? In addition, and in this day and age of 144Hz and 4K displays, the screen on the G5 also comes across as a little dated and dim. If you’re after a machine that you can play games on, rest assured that they’ll look fine on this thing. However, they lack some of the luster you’ll find elsewhere. Despite these drawbacks, the Dell G5 acquitted itself admirably when it came to performance. Even when it came to heavy-duty titles like Kingdom Come: Deliverance and Total War: Warhammer II, it held up remarkably well. With the graphics set to medium, the Dell G5 ran the medieval Bohemian simulator with pitchless smoothness. Cranked up to ultra-high, things got a little more choppy but were still very much playable. When it came to Total War: Warhammer II, the G5 continued to deliver impressive, and more-consistent results. With the game’s advanced graphical settings moved to Ultra, the game’s epic battle sequences played out at a mostly-stable 55-60FPS. 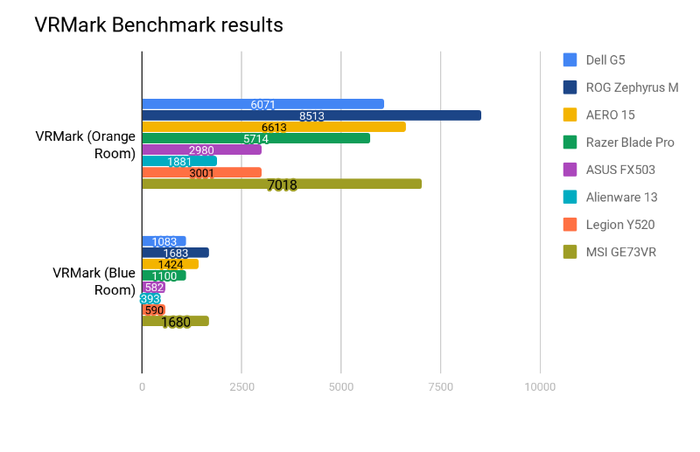 We were left similarly impressed by the benchmarks results produced by the G5. When it came to PCMark 10, it ranked a close-third out of the nine PCs we compared it to. 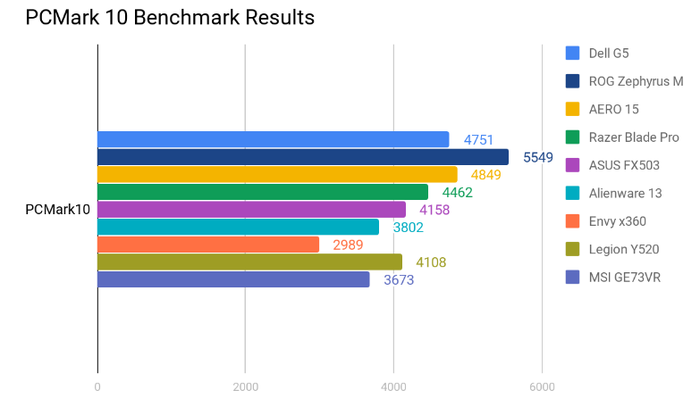 Then, with regards to 3DMark’s TimeSpy, FireStrike and FireStrike Ultra benchmarks, the G5 repeatedly emerged as a compelling middle-of-the-road candidate in the race for portable supremacy. It didn’t necessarily outpace powerhouses like the ROG Zephyrus M and Gigabyte’s AERO 15. However, it got surprisingly close given the price disparity. What’s more, it cleanly beat out more comparable offerings from Lenovo, Razer and even Alienware’s own stock. Finally, we put the Dell G5’s VR chops to the test. Here it slipped a few slots and lost some ground to the competition but still managed to emerge with some more-than-just-respectable results. 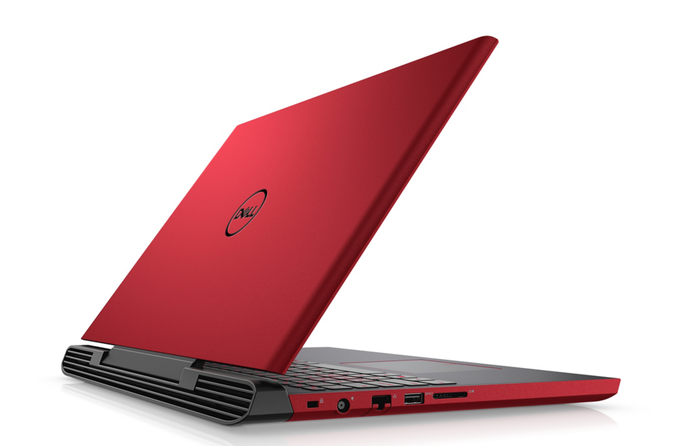 Read more Which Dell Laptop Should I Buy? In terms of battery life, we found that the Dell G5 offered notably better battery life than we expected from it. When subjected to the Battery Eater testing tool, the Dell G5 took 2 hours and 34 minutes to dissipate its entire charge. This test is designed to burn the battery down as fast as possible and show off the minimum amount of battery life you can expect. 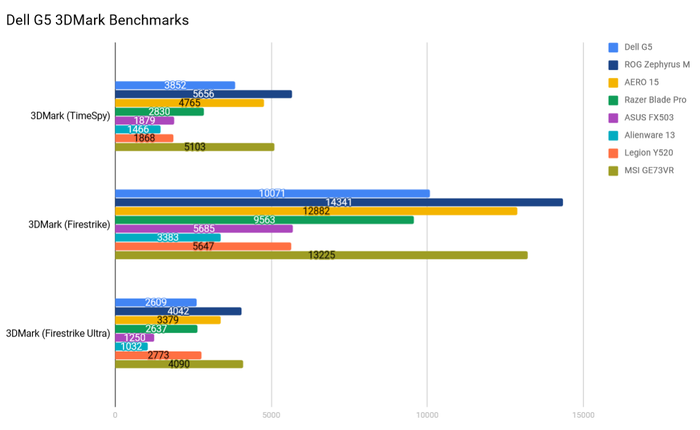 Since everyone’s ordinary usage patterns - and the impact that those patterns will have on your battery life - are going to naturally vary, this is generally a good way to gauge how the battery on one gaming notebook compares to another but won’t necessarily reflect your exact everyday experience with the machine. In context, however, this result is approximately double what we got out of the ASUS FX503, Razer Blade Pro and Aorus X9 - and about half what we got the from the AERO 15. More anecdotally, we found that the Dell G5 was a little noisy at times of peak performance but proved itself robust when it came to handling heat build-up. The best thing I can really say about the G5 is that the price of the thing really adds a lot of color and helps makes it easy to recommend in a way that most gaming laptops aren’t. Usually, the expectation if you’re looking to buy a gaming laptop is that you’re not going to get by with anything cheaper than $2000 or $3000.